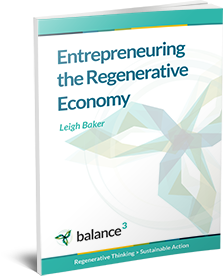 In the 21st century, could the continuing shift to a Regenerative Economy mean the end of philanthropy as we know it? First you make money – then you spend it fixing the problems you created in making that money. You try and “repair” the environmental and social damage you created. As we continue to shift towards an economy that consumes greenhouse gases, regenerates ecosystems and renews communities, what is the future of “philanthropy”? Could it be that – as we realise the improved profits of “doing well BY doing good” – we won’t need so much “charity” from “philanthropists”? Yes, it’s a BHAG – but it’s about “beginning with the end in mind” and doing more good instead of less harm.